Asien im XIten und XIIten Jahrhundert. Die Reiche der Seldschuken; der Altun Khane in Hochasien und der Muhametaner in Indien.. 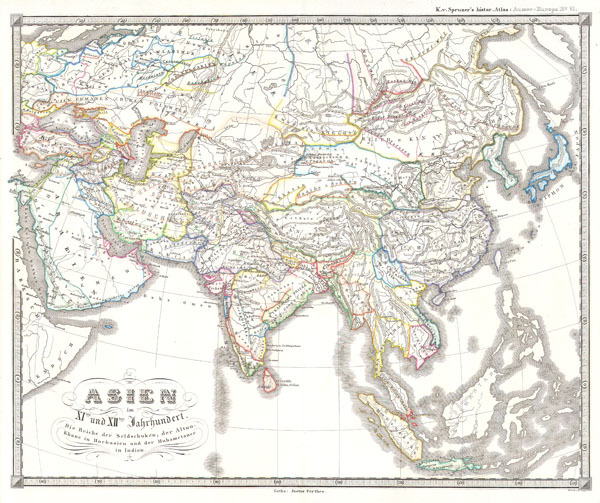 This fascinating hand colored map depicts Asia in the 11th and 12th centuries. This period corresponds with the Song dynasty of China, the rule of Altun Khan (Daughter of Ghengis Khan) in Mongolia, and the Seljuk Turk Empire in Persia and Asia Minor. All text is in German, but the title roughly translates as 'Asia in the 11th and 12th century. The realms of the Seljuk Turks; the Altun Khan in Mongolia and the Mohammudeans in India.' Map was originally part of the 1855 edition of Karl von Spruner's Historical Hand Atlas.